PA D Series Monoblock Class D Car Amplifier / Marine Certified. CEA-2006 Compliant Amplifier. 4-way protection circuitry (thermal, overload, reverse polarity & speaker short protection). 4 ohms: 500 watts x 1 chan. 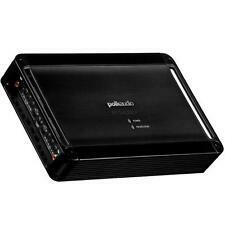 PA D Series 4-Channel Class D Car Amplifier / Marine Certified. CEA-2006 Compliant Amplifier. 4-way protection circuitry (thermal, overload, reverse polarity & speaker short protection). 4, 3 and 2 Channel Operation. 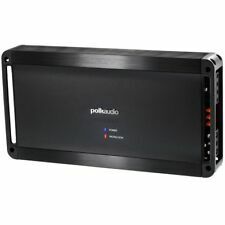 Polk Audio PAD1000.1 Class D Monoblock 1-channel Car Marine Subwoofer Amplifier. Condition is New. Never been out of box Brand factory new!!! 800 watts @ 2ohm 1200 watts @ 1ohm Bass knob included Class D Amplifiers are higher efficiency with power output than the class A/B LAST ONE! (2) Polk Audio DB842SVC 8” 1500 Watt Single 4-Ohm Car/Marine Boat Audio Subwoofers. Polk Audio DB842SVC 8” 750 Watt Single 4-Ohm Car/Marine Boat Audio Subwoofer Sub. Item Code: (2) DB842SVC dB12 RWK41. A low THD, a high signal-to-noise ratio, plus wide bandwidth frequencies, make the new PA D1000.1 a high performance monoblock for high performance bass. • RMS Power at 4 Ohms: 500 watts x 1. • RMS Power at 2 Ohms: 800 watts x 1. (2) Polk Audio DB842DVC 8” 1500 Watt Dual 4-Ohm Car/Marine Boat Audio Subwoofers. Polk Audio DB842DVC 8” 750 Watt Dual 4-Ohm Car/Marine Boat Audio Subwoofer. Item Code: (2) DB842DVC RXD-M1 RWK41. Authorized Polk Dealer! Polk Audio PA 880 1-Channel Car/Boat Amp NOTWORKING. Condition is For parts or not working. Shipped with USPS Priority Mail. For parts only , I have not tested it.